The picture above taken of a 6ft version of this model we refurbished a year or so ago. Comes with 4 piece mahogany table top. Brand new Hainsworth Smart wool napped cloth. The table top is approx 68" x 38" playing area size is 57" X 27" The overall size is 65" X 35". Playing height 32.5"inches dining height 29.5"inches. 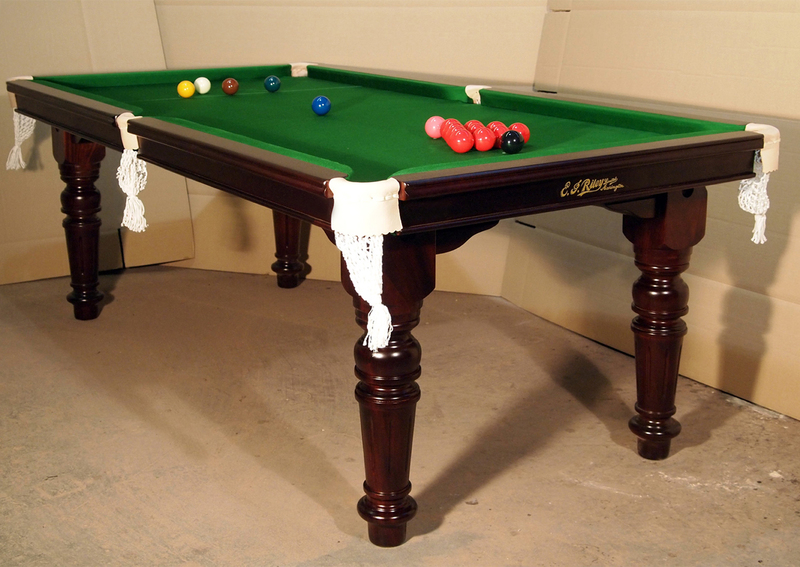 "This is a beautiful antique snooker table." Made in the 1930's in Accrington England from solid African Mahogany. Precision Ground 1 piece 1/2" Welsh Slate. Will also come supplied with 2 x new Snooker cues. Set of New 1" 7/8" snooker balls, Cue Rest, Hardwood Scoreboard and Triangle. Free NW England ground floor install and delivery, other areas usually £100 surcharge. Contact to arrange 20% deposit or if your snooker room is not ready to secure this table. Cash balance to be paid at point of installation to your satisfaction. All our tables are fully refurbished in Accrington, Lancashire by ex E.J Riley employees.